Hi welcome back to my blog. This week the challenge is Bingo. So basically you do a straight line across the bingo card, either diagonal or up and down or vertical. Pretty straight forward, just like a real bingo card. I made my own pin for this challenge as well, just to do something a bit different. You can buy beads and the straight pins at the local craft store. You just put together a design that you like, I used glossy accents to glue the bottom on. It worked great and its held very well. 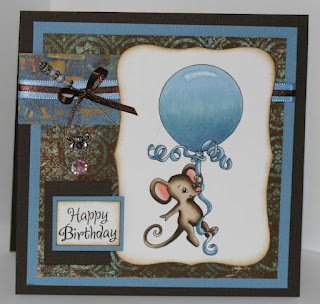 The image that I have used is from Whimsy stamps by Crissy Armstrong called Free Ride. I thought this would be a fitting image for a birthday card. You should jump over to the Whimsy Inspires blog to check out the other Dt's wonderful creations as well. Hope you get some inspiration along the way. A close up of my colored image. A closer look at my push pin that I made. Easy and fun to do. Supplies: Whimsy digi image Free Ride, Spellbinder Label Eight, Bazzill cardstock, Copic markers, Ribbon, Blue Moon Charm. My goodness you have done a great job. I love your card. Super cute girlie...love that mouse, and the push pin, nice touch. Nice colors too....TFS! Great colouring Charlene! The way you've coloured the mouse pulls your eye right to the image and the balloon is perfect... reflecting the light too!